Jusubali Jamylbaev, 48, a shepherd, fills a bottle with water from River Soh in Aktoprak, Kyrgyzstan. A river near the village of Lyaily near Beshkent, Kyrgyzstan, which feeds an aryk, an irrigation canal. A man drinks water from a muddy irrigation canal at a teahouse in Beshkent, Kyrgyzstan. Nurjamal Alimbekova, 16, lives in the village of Lyaily where nearly all 300 families use water from an irrigation canal. Children wash their hands before snack time in the village of Lyaily. Talant Alibekov, 37, suffered from brucellosis, a disease that comes from water contaminated by sick animals. Children return from school in the village of Lyaily. “We drink the water and it’s not good,” explained Abdubana Raputor, who lives at the edge of a river near Beshkent. A Soviet-era pumping station in the village of Andarhan. That water is not controlled for human consumption. Atyrgul Tagaibekova, 12, at a hospital with symptoms of hepatitis. The hospital depends on water from an irrigation canal. Zarina Nurai Kyzy holds her infant daughter, who is suffering from gastrointestinal distress. A hospital worker holds a bucket she uses to gather water from an irrigation canal near the hospital. In Kyrgyzstan’s southern Batken Region there is a village called Beshkent, where 12,000 people depend on water delivered by irrigation channels called aryks. These channels are vulnerable to contamination from animals, debris and trash. At the medical clinic in Beshkent, head physician Abid Madaliev treats numerous cases of hepatitis, gastrointestinal infection and brucellosis, a joint disease that is transmitted from livestock to humans through contaminated water. Cases of gastrointestinal infection in the village are double the national average. Madaliev says that although vaccines are given to newborns, he sees many hepatitis cases – about 20 per month. Instances of waterborne diseases are “especially acute in autumn, when leaves falling in the aryk leads to the growth of bacteria,” he said. In Kyrgyzstan, lack of access to clean water is the cause of health issues in hundreds of villages like Beshkent. 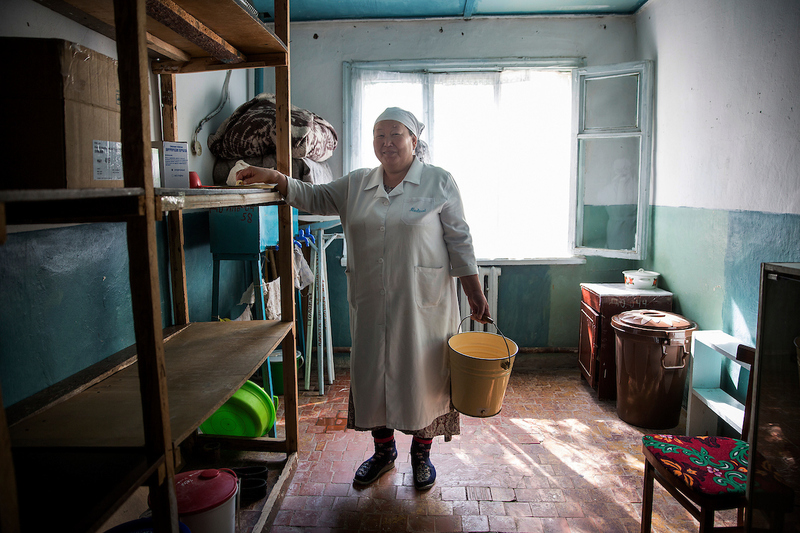 Each year, Kyrgyz officials record 30,000 acute intestinal infections, 24 percent of which are related to parasites. Up to 86 percent of typhoid cases occur in villages that lack safe drinking water. The Batken region, which borders Tajikistan and Uzbekistan, is one of the worst affected areas. "If we had a central system and a treatment plant, we could use chlorine to clean the water, and the number of sick people would definitely decline," Madaliev said. Kyrgyzstan is blessed with an abundance of water thanks to glaciers, lakes and rivers. Still, 150,000 people in 390 villages in Kyrgyzstan depend solely on aryks for drinking water because supply systems function poorly or are nonexistent. In many rural communities, Soviet-era plumbing infrastructure has fallen into disrepair. New supply projects must be financed locally. Area residents must raise the initial investment funds in order to partner with the World Bank, UNDP and other investors. The biggest problems communities face is the initial funding, explains Vladimir Grebnev, Program Coordinator for Environment Protection for Sustainable Development at UNDP Kyrgyzstan. Kanybek Alimbekov, a Beshkent politician and hydro-engineer, leads a team trying to bring clean water to villagers in Beshkent. Over the past decade, the village government has managed to set aside about $12,000 (or 5 percent of the overall estimated cost) for the installation of 20 kilometers of pipeline and a water treatment facility. Due to inflation, rising costs and other economic factors, the project has stalled. Ultimately, the reliance on local financing is untenable. Local governments are capable of contributing funds, but in a country like Kyrgyzstan, where poverty is widespread, locals often lack the resources that would enable communities to finance such infrastructure projects on their own, Grebnev said. “In a village with a population of 5,000, water infrastructure may cost at least $200,000,” Grebnev explained. Jodi Hilton is an independent photographer.